Adopting digital fabrication technologies in the dental office presents barriers, of course, including fear of the learning curve, and pragmatic considerations regarding training and the possible addition of new equipment, such as a milling machine.5 As systems become more advanced, however, they often become more user friendly. For example, issues with mimicking jaw movements are being addressed with the introduction and refining of virtual articulation. The use of CAD/CAM virtual articulators replicates the movement of the mandible in the same way an adjustable articulator would. 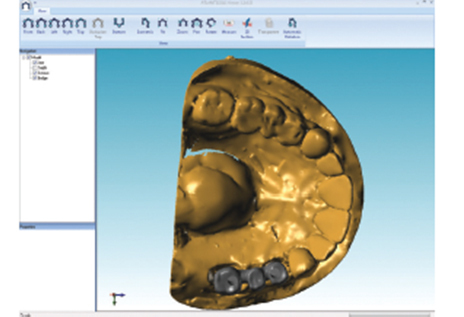 Manufacturers have developed desktop scanners that can scan mounted maxillary and mandibular casts, and transfer a mechanical articulation into a virtual one. Special software then calculates the posterior and anterior guidance features necessary to adjust the prosthesis to match the patient’s three-dimensional (3D) mandible movement. FIGURE 2. Design of a three-unit, implant supported fixed dental prosthesis (teeth #12–14). Current literature supports the application of IOS in manufacturing implant prostheses. In vitro studies demonstrate a comparable level of accuracy (i.e., precision and trueness) when using conventional impression techniques and various IOS systems — with or without the use of scanning powder — for dentate full arches.8 A systematic review by Rutkūnas et al9 concluded that “digital implant impressions offer a valid alternative to conventional impressions for single- and multiunit implant-supported restorations.” However, the evidence was mainly obtained from in vitro studies, therefore, the authors suggested the need for more well-designed in vivo studies, and that “digital implant impression techniques still have to be improved in order to fully substitute for conventional ones.” Papaspyridakos et al10 investigated the angulation of implants, implant versus abutment-level impressions, and splinting versus nonsplinting. They reported comparable results between digital and conventional implant impressions for completely edentulous patients. The team also noted that if an implant-level impression is used, the splinted technique is more accurate than a nonsplinted approach, especially if the implant angulation exceeds 15°. On the other hand, the abutment-level impression showed no difference in accuracy between splinted and nonsplinted techniques. FIGURE 3. Custom-milled abutment replacing tooth #30. Following the digital impression, designing the restoration (via CAD), and producing a virtual model (Figure 2), the practitioner is ready to fabricate a restoration utilizing CAM technology. This technique can be used to fabricate implant abutments (Figure 3), prostheses (Figure 4 and Figure 5), and frameworks (Figure 6). The restorations are fabricated through a subtractive milling method or additive manufacturing (e.g., 3D printing and rapid prototyping). Milling utilizes subtractive manufacturing technology to mill from solid disks or blocks to produce the desired restoration. Computer numerically controlled machining is the subtractive method that uses a cutting tool to mechanically cut the material to achieve the desired geometry.11 Suitable materials include titanium, chromium cobalt, polymethylmethacrylate (PMMA), polyurethane, wax, lithium disilicate, zirconia and zirconia-reinforced lithium disilicate. In addition new materials are emerging that include the high-performance thermoplastic polymer polyaryletherketone (a commercially available example would be Pekkton), and a tooth-shade nanohybrid polymer reinforced with multilayered glass fiber (Trinia). FIGURE 4. 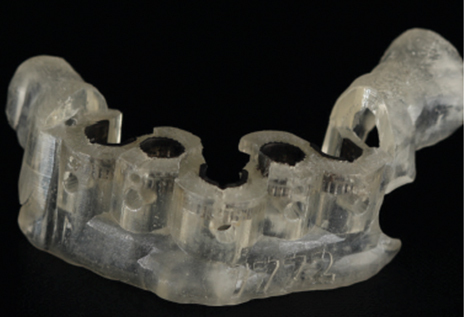 Custom-milled three-unit, implant-supported fixed dental prosthesis — lateral view. FIGURE 5. Custom-milled three-unit, implant-supported fixed dental prosthesis — occlusal view. When compared to conventional abutments, CAD/CAM abutments demonstrate good survival and success rates,16 provide superior soft tissue reaction (i.e., less recession),17 and reduce the incidence of screw loosening.18 Long et al16 report that, overall, CAD/CAM abutments provide comparable, if not better, clinical outcomes than conventional abutments. In addition, digital fabrication technology can render accurate partial (Figure 5) and complete frameworks for fixed (Figure 8 and Figure 9) and removable treatment approaches. Titanium is the gold standard metal in milling implant suprastructures from solid blocks; other materials include cobalt-chromium alloys, or monolithic and layered zirconia. FIGURE 6. Custom-milled fixed complete denture framework. Milling with CAD/CAM equipment eliminates the distortion and porosity induced by the classic lost-wax casting technique. The larger the frameworks and the more implants involved, the more obvious CAD/CAM advantages become.3 This accuracy will ensure that implant frameworks/abutments have ideal passive fit to limit movement and bacterial leakage.19 Abduo3 reports that CAD/CAM implant frameworks fabricated with titanium and zirconia have high level of accuracy with a passive fit that surpasses the one-piece casting or laser-welded frameworks. A systematic review by Kapos and Evans20 found that use of CAD/CAM frameworks for implant-supported restorations provides clinical outcomes comparable to conventional techniques in terms of implant and prosthesis survival, technical considerations and biological complications. Regarding monolithic zirconia with gingival coloring and zirconia with veneered porcelain (limited to the gingiva), Bidra et al21 report that after following 285 fixed complete dentures for eight years, this modality offers promising results, with no adverse effects on supporting implants, opposing teeth, hard or soft tissues, temporomandibular joint issues, or patient dissatisfaction. FIGURE 7. Three-dimensionally printed implant surgical guide. Technological advances offer new materials or concepts that provide solutions for complicated situations (such as limited restorative space, misplaced implants and parafunctional habits). Traditionally, the interarch space (i.e., crest of soft tissue to antagonist occlusion) required to restore fully edentulous jaws with implant prostheses ranges from 7 mm (metal ceramic fixed design), 8 mm (locator retained overdenture), 11 mm (milled bar for fixed complete denture), or 12 mm (Dolder bar over denture).22 When clinicians are faced with limited interarch space, a decision has to be made whether to utilize metal ceramic crowns and bridges. An alternative is to use new materials, such as Pekkton23 and Trinia,24 or utilize new framework designs, such as a PMMA or zirconia overlay that is cemented on a titanium framework.25 At present, the literature provides only case reports regarding these materials and designs, thus, the evidence is limited. 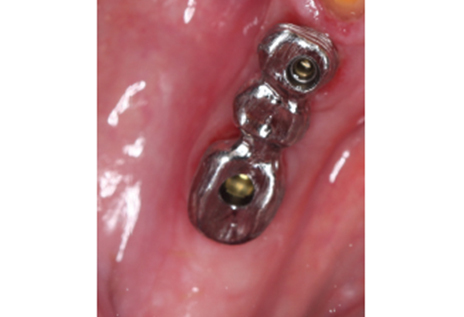 The range of clinical solutions in­cludes products such as Angulated Screw Channels-ASC (Nobel Biocare) and Angulated Screw Access-ASA (Atlantis) that help operators manage misplaced implants and hide screw access for esthetics, as these technologies allow screw access up to 25° (ASC) to 30° (ASA) from the implant axis. FIGURE 8. Cobalt-chromium milled framework following polymethylmethacrylate veneering. Besides clinical performance, cost effectiveness is a pragmatic consideration in any therapy.26 Beyond the investment in scanners and/or in-office milling equipment, practitioners must consider the cost of training and technical support. 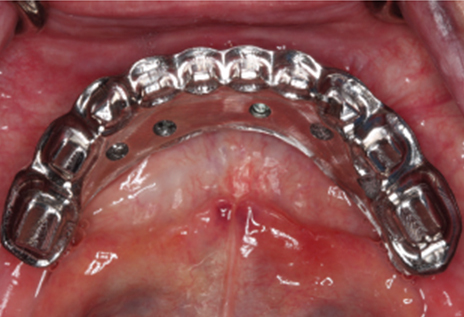 In light of this, Joda and Brägger27 performed a cost/time analysis comparing conventional and digital workflows for fabricating an implant-supported, single-unit crown. They reported an 18% cost reduction with the digital process — which suggests long-term productivity when compared with the initial investment. Long-term success and patient-reported outcome measures are among the methods used to assess a treatment modality. Regarding digital fabrication of implant prostheses, a consensus statement was published28 during the 4th European Association for Osseointegration consensus conference. Limited studies were included from which to draw conclusions (one involving single crowns, one involving fixed dental prostheses (FDPs), and 10 studies of full-mouth rehabilitation). The reported cumulative survival rates for abutments and frameworks were promising, and ranged from 95% to 100% over observation periods of one to five years. The most frequent complication was chipping of veneering materials (ceramic or resin). The research team concluded that short-term studies demonstrate promising results; however, long-term clinical studies were limited. FIGURE 9. Mandibular cobalt-chromium milled framework following polymethylmethacrylate veneering. To assess partial fixed zirconia prosthesis, Larsson and Vult von Steyern29 used a randomized, prospective clinical trial to study the 5-year clinical performance of 25 all-ceramic FDPs (12 fabricated from a zirconia-toughened alumina, and 13 from a yttria-stabilized tetragonal zirconia polycrystal material). While all of the frameworks showed acceptable survival rates, the authors noted a complication with chipping of the veneering porcelain. 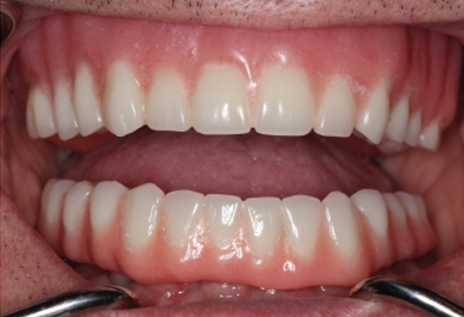 They recommended caution prior to using layered zirconia prostheses. These findings explain the high survival rate shown by Bidra et al21 when monolithic zirconia prostheses were utilized without veneering, or veneering limited to the gingival portion of the prosthesis. There is optimism about the future of implant dentistry and the impact of CAD/CAM on the clinician and patient experience. Considering this is fairly new technology, the use of CAD/CAM implant prostheses is supported by short-term, in vitro studies. Further evidence is needed, however, and the profession awaits long-term results from well-designed in vivo research. Based on what is presently known, it is likely that, going forward, digital fabrication will play an even larger role in implantology and the manufacturing of dental implant prostheses. Issues with mimicking jaw movements are being addressed with virtual articulators that replicate the movement of the mandible in the same way an adjustable articulator would. Kapos T, Ashy LM, Gallucci GO, Weber HP, Wismeijer D. Computer-aided design and computer-assisted manufacturing in prosthetic implant dentistry. Int J Oral Maxillofac Implants. 2009;24 (Suppl): 110–117. Abduo J. Fit of CAD/CAM implant frameworks: a comprehensive review. J Oral Implantol. 2014;40:758–766. van der Zande MM, Gorter RC, Wismeijer D. Dental practitioners and a digital future: an initial exploration of barriers and incentives to adopting digital technologies. Br Dent J. 2013;215:E21. Joda T, Brägger U. Patient-centered outcomes comparing digital and conventional implant impression procedures: a randomized crossover trial. Clin Oral Implants Res. 2016;27:e185–e189. Mangano F, Gandolfi A, Luongo G, Logozzo S. Intraoral scanners in dentistry: a review of the current literature. BMC Oral Health. 2017;17:149. Ender A, Mehl A. In-vitro evaluation of the accuracy of conventional and digital methods of obtaining full-arch dental impressions. Quintessence Int. 2015;46:9–17. Rutkūnas V, Gečiauskaitė A, Jegelevičius D, Vaitiekūnas M. Accuracy of digital impressions with intraoral scanners. A systematic review. Eur J Oral Implantol. 2017;10 (Suppl 1):101–120. Papaspyridakos P, Gallucci GO, Chen CJ, Hanssen S, Naert I, Vandenberghe B. Digital versus conventional implant impressions for edentulous patients: accuracy outcomes. Clin Oral Implants Res. 2016;27:465–472. Alghazzawi TF.Advancements in CAD/CAM technology: options for practical implementation. J Prosthodont Res. 2016;60:72–84. Sailer I, Philipp A, Zembic A, Pjetursson BE, Hämmerle CH, Zwahlen M. A systematic review of the performance of ceramic and metal implant abutments supporting fixed implant reconstructions. Clin Oral Implants Res. 2009;20:4–31. Taylor TD, Klotz MW, Lawton RA. Titanium tattooing associated with zirconia implant abutments: a clinical report of two cases. Int J Oral Maxillofac Implants. 2014;29:958–960. Chun HJ, Yeo IS, Lee JH, et al. Fracture strength study of internally connected zirconia abutments reinforced with titanium inserts. Int J Oral Maxillofac Implants. 2015;30:346–350. Conejo J, Kobayashi T, Anadioti E, Blatz MB. Performance of CAD/CAM monolithic ceramic implant-supported restorations bonded to titanium inserts: a systematic review. Eur J Oral Implantol. 2017;10 (Suppl 1):139–146. Long L, Alqarni H, Masri R. Influence of implant abutment fabrication method on clinical outcomes: a systematic review. Eur J Oral Implantol. 2017;10 (Suppl 1):67–77. Lops D, Bressan E, Parpaiola A, Sbricoli L, Cecchinato D, Romeo E. Soft tissues stability of CAD/CAM and stock abutments in anterior regions: 2-year prospective multicentric cohort study. Clin Oral Implants Res. 2015;26:1436–1442. 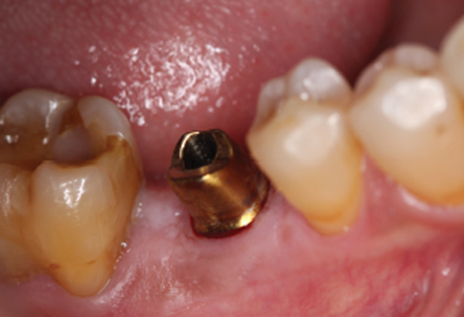 Korsch M, Walther W. Prefabricated versus customized abutments: a retrospective analysis of loosening of cement-retained fixed implant-supported reconstructions. Int J Prosthodont. 2015;28:522–526. Karl M, Taylor TD. Parameters determining micromotion at the implant-abutment interface. Int J Oral Maxillofac Implants. 2014;29:1338–1347. Kapos T, Evans C. CAD/CAM technology for implant abutments, crowns, and superstructures. Int J Oral Maxillofac Implants. 2014;29 (Suppl):117–136. Bidra AS, Rungruanganunt P, Gauthier M. Clinical outcomes of full arch fixed implant-supported zirconia prostheses: a systematic review. Eur J Oral Implantol. 2017;10 (Suppl 1):35–45. Sadowsky SJ, Fitzpatrick B, Curtis DA. Evidence-based criteria for differential treatment planning of implant restoration for the maxillary edentulous patient. J Prosthodont. 2015;24:433–446. Han KH, Lee JY, Shin SW. Implant-and tooth supported fixed prostheses using a high-performance polymer (Pekkton) framework. Int J Prosthodont. 2016;29:451–454. Passaretti A, Petroni G, Miracolo G, Savoia V, Perpetuinia A, Cicconetti A. 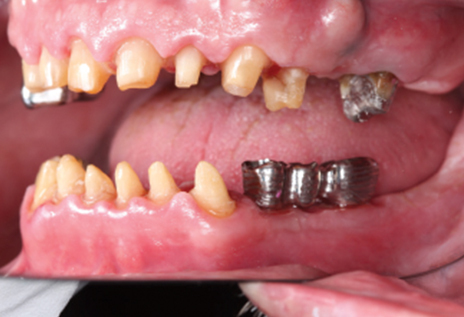 Metal free, full arch, fixed prosthesis for edentulous mandible rehabilitation on four implants. J Prosthodont Res. 2018;62:264–267. Cagenix AccuFrame 360. Available at: cagenix.com/cagenix-360/. Accessed May 25, 2018. Eaddy MT, Cook CL, O’Day K, Burch SP, Cantrell CR. How patient cost-sharing trends affect adherence and outcomes: a literature review. P T. 2012;37:45–55. Joda T, Brägger U. Digital vs. conventional implant prosthetic workflows: a cost/time analysis. Clin Oral Implants Res. 2015;26:1430–1455. Hämmerle CH, Cordaro L, van Assche N, et al. 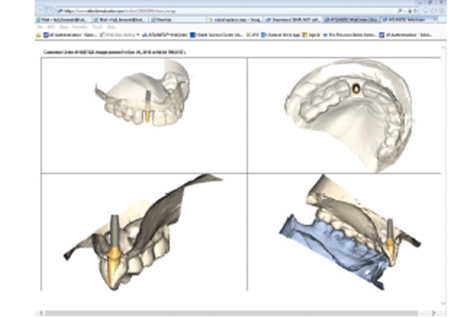 Digital technologies to support planning, treatment, and fabrication processes and outcome assessments in implant dentistry. Summary and consensus statements. The 4th EAO consensus conference. Clin Oral Implants Res. 2015;26 (Suppl 11):97–101. 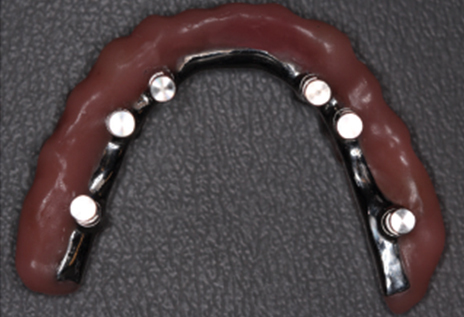 Larsson C, Vult von Steyern P. Five-year follow-up of implant-supported Y-TZP and ZTA fixed dental prostheses. A randomized, prospective clinical trial comparing two different material systems. Int J Prosthodont. 2010;23:555–561. From Decisions in Dentistry. September 2018;4(9):22–25. Fadi AL Farawati, DDS, MS, MClinDent, is an assistant professor in the Department of Restorative Sciences at the Dental College of Georgia at Augusta University. He is a dual specialist in prosthodontics and periodontics, and his clinical and research interests include dental implant prostheses and oral rehabilitation. He can be reached at falfarawati@augusta.edu.